Who does not like the sweet, juicy and red strawberries. The fragrance, its taste and the goodness makes us want it more. Strawberries are a storehouse of Vitamin C and antioxidants which protects the body against cell damage. Also this Vitamin C rich juice secretes lots of proteins in the body which in turn flushes out the toxins from our body. Strawberry acts as a preventor against cancer as it is rich in ellagic acid. It also strengthens the immunity of the body against illness. If one is prone to falling sick quite often, then strawberries must be added to the diet. It further gives strength to the body to heal and boosts the tissue strength as well. Strawberries are also very good for the vision as it strengthens the cornea and the retina. Strawberry syrup acts as a great supplement for the desire to have a dessert. It not only tastes good but also promotes good health. Rich in varied nutrients it helps in preventing diseases like asthma and arthritis. Strawberries are excellent for skin, hair and health. All this and much more gives us an added chance to consume more of this delicious fruit. 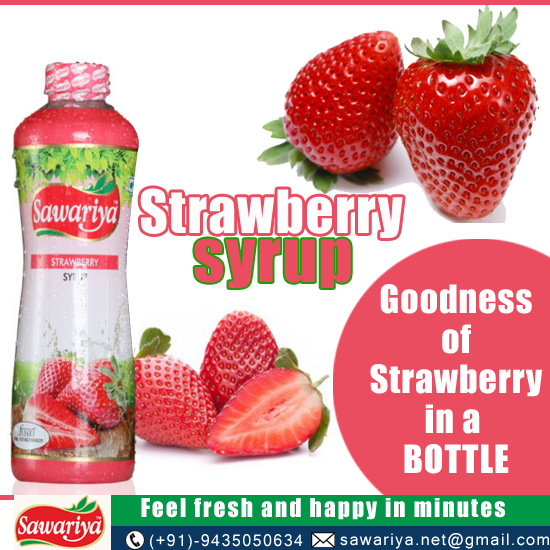 try out the strawberry syrup from Sawariya and taste instant freshness.